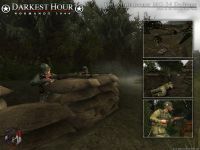 Darkest Hour December Press Release Part 2: Welcome to the Final Darkest Hour Press Release of the Year! Welcome to the Final Darkest Hour Press Release of the Year! It has been another hectic few weeks in the run up to Christmas for the developers over at Dark-Light Games. We do however have several very exciting updates to bring. First and foremost it was with great surprise that we found out that Darkest Hour (along with Mare Nostrum) had made the final 100 mods in the MODDB Mod of the Year Awards. We sincerely appreciate all your votes and ask that you continue voting at the link below. We are also very pleased to announce our 5 Clan Beta Winners have been chosen. 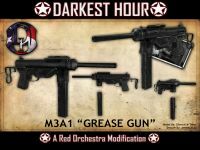 The latest weapon the be added to Darkest Hour is the M3A1 “Grease Gun”. This compact SMG will be helping the US forces keep the Germans pinned down. The model was originally made by Silence 14 and donated to Darkest Hour some time ago before being finished off by Tman. The texture is by Aeneas2020. Finally as always I have included some in game action shots from this weeks test sessions. I want to wish TWI and the RO community a Very Merry Christmas and a big Thank You from all those involved with Darkest Hour for a great year. Keep up the support and stay tuned for exciting updates in the New Year! Until Next Time, Merry Christmas, BON NOËL & Frohe Weihnachten euch allen ! stalker buddy u forget to embed the trailer :S lol...oh well the trailer is on our moddb profile guys (i guess if a kind mod wants to embed it for us that would be cool) if not then head over there. Merry Christmas to the whole Moddb Community and thanks for the support this year! Awesome, epic stuff! :) Keep up the great work!